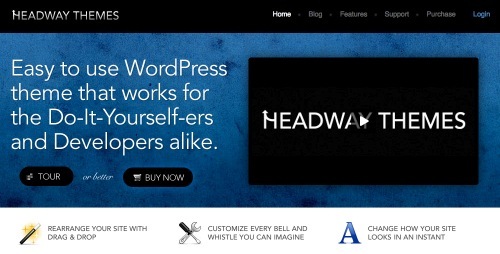 Headway Theme Review: How Does it Stack Up? You may have heard of this little WordPress theme called Thesis? Well, if you haven’t, you obviously haven’t been reading this blog, so get on board. Thesis finally has some competition in the market in a new WordPress framework/theme called Headway. Headway is young and has a lot of competition in the premium theme market (Thesis, WooThemes, etc), but there’s already a lot of buzz about the theme and it’s being used by Jay Fleischman, Chris Cree, John Haydon and of course Jason Wietholter (yours truly). Now, I’m not a WordPress genius like Ben and I’m not an SEO guru either. I know business and I know enough about the web to be dangerous (mostly to myself), which is precisely why Headway (*gasp* its an affiliate link!) has been so incredibly helpful for me. But instead of continuing to gushing about how it’s the best thing since sliced bread, let me give you my take on the Headway theme. The “out of the box” layout is strictly text and doesn’t feature any really special features that are offered in the backend. As noted in Ben’s review on Thesis, the same applies to Headway, the title and description are actually text and not an image you have to create, although you do have the option to include an image and it is exceedingly simple. I’ve not used the Thesis to be able to compare, but Headway’s flexibility is second to none for me. I can redistribute items as I see fit. Create new sidebars and duplicate them across pages. I can even customize the 404 page directly in Headway. 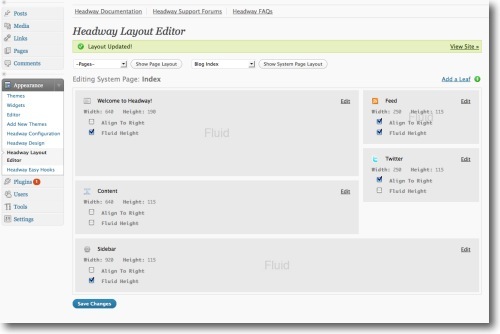 Headway let’s you customize the layout of each page in the Layout Editor. You can add what they title “Leafs” for different types of content, such as: Image Rotator, Featured Post rotator, Widgetized Sidebar, RSS Feed and Content or Text/HTML and a few more. It’s infinitely customizable and each Page or System Page can be customized with a drag and drop layout. If you move to the Design item in the Appearance tab in the WP Sidebar, you get a plethora of options to re-design everything in your site. There is even the capability to add your own custom.css file or download/share “skins”. However, the Headway community isn’t as big or well-established as Thesis, so you won’t find a lot of shared skins yet. One more thing. Headway allows you to move the Meta tags for posts and pages around and also has “hooks” for adding content after every post, after the header, before the footer and on and on. With all the ability you have to customize every single page of your site, Headway makes a gymnast look tight and stiff. Headway was extremely easy for me to figure out and use. If you follow the new Headway items in the Appearance tab in the order they appear, you can set up all the options of your site very quickly and easily. Just like with Thesis, you can customize every bit of CSS, but unlike Thesis, there is no PHP to learn unless you really, really want to. As I stated before, I’m not a SEO or CSS guru, but Headway helped me design a fairly nice site with minimal effort and I got it on the first page of Google in just a few days. While that may not be a big deal for some of you, it is huge for me and I attribute that success directly to Headway’s easy to use SEO options. Headway features drag and drop simplicity, offers slew of options, and is infinitely customizable. You really get to choose your own level of difficulty, but 90% of the functions are right at your fingertips in the WP Admin pages. This is hard for me to review as I haven’t had any need to use it. From what I have seen, the documentation is available and there is a forum for users to discuss any issues and share ideas, but I just haven’t needed it. Obviously, with Headway being so young it doesn’t have the same number of users as Thesis, so community support will be lacking in terms of shear size. I’ve used a lot of themes from designers and theme brokers, but Headway is the first one that really allowed me to get what I wanted out of a theme and I haven’t even scratched the surface of its total capabilities. I mean, take look at my site: jasonwietholter.com. It has no custom.css and I only broke away from the built in options by adding an image as a header (which is arguably, built in) and the image in the sidebar. In all honesty, I haven’t even scratched the surface of what Headway is capable of and I think you could write a book to cover and thoroughly explain all of the features. I would absolutely recommend the theme. Note from Ben: We’re going to hold off on giving Headway an official score for now. As Jason mentioned, he’s not used Thesis and despite my best efforts, I haven’t had a chance to really sink my teeth into Headway just yet. So, trying to rate how Headway stacks up against other themes that I have much more experience with (namely Thesis) just wouldn’t be fair at this point. However, thanks in large part to Jason’s review, I’ve decided to dedicate time in the coming week to getting familiar with Headway. I’ve been wanting to redesign my personal site, Skitzzo.com for a while now and this seems like the perfect opportunity. It certainly sounds like Thesis may have a challenger for the top score on the list so I’ll be sure to let you all know when the final score comes down. Jason Wietholter is an entrepreneur of multiple businesses online and off, and pretty much as nice a guy as you’d ever want to meet. You can find him at jasonwietholter.com and lurking around the “internets” on Twitter @jasonwietholter. I’ll vouch for him any day & can promise you won’t be disappointed by the information he provides. So far, the reviews I’ve seen have been by people who are creating new sites. I would like to know how easy/hard it is to install the new theme onto an existing wordpress blog. I’m fairly tech savvy. How easy to switch from a Thesis themed site, or a Revolution News Theme (the older ones, not the new studio press themes). The other thing I’ve noticed, is that the pages on Headway’s site that they use as examples seem to load a tad slower than Thesis themes. I’m not sure if it is my imagination, the fact that the site owner did not optimize the image, or what. But I’m curious. 1) It allows drop down menus for pages, parent/child – does Headway do this easily? (It is not easy to do in Thesis – again at least not for me) and it looks from the videos, like you can choose the order in headway – it does not have to be alphabetical across the top? 2) Revolution News theme allows you to select which category of posts should show up on the home page – I have the most recent post in each of 4 different categories show. It sounds like Headway’s featured content box would do that? 3) Another site I run on is on the Thesis theme, I like Thesis’s idea of rotating images, but I would love the option of a different static image for each page (not each blog post, I know how to do that). Thesis’s options seem to be rotating image, static image (the same one for each page) or a static video – the same on each page. I would like to see a different image on each page, that reminds people – oh, this is the page with XYZ content, as suggested by an image. I’m sure it can be done in Thesis, I just haven’t figured it out. Is this type of thing easy in headway? I will say, Thesis is still great for my money, does many things much more simply and more flexibly than other themes, and with way less coding, and they claim that they will be incorporating easier design changes in version 2.o soon, due in part of competition from Headway. Sorry for so many questions, but if you are able to answer them, be sure I will point others here to find out more about headway, thesis etc. 1) It does. In the theme there is an option to “Show Sub-pages”. If you check the box, they’ll show up. Go to my site and hover over About Me. It grabs the CSS from the static header CSS. I haven’t investigated if you can customize each (the static items and the rollover items), but I would be that you can. 2) Headway’s Featured Content Box does allow that. In fact, click on the page that I created for the rollover above (About Me > About JMW) and you can see what it looks like. You can select which category(s) it displays, as well as rotating (left column) or listed (right column). In addition, the Featured Leaf allows you to customize Post Meta data too. 3) I think I comprehend what you are saying, I know of 2 ways to do it in Headway. A) you should be able to do this in Thesis too (or any WP Page) add an image at the top of the page. B) You can customize the layout of each page with static content and add an image in as a 2nd header of sorts and then apply content around it. Check that out and let me know what you think. Jason & C. Lark, #3 is possible within Thesis as well by using either the post image option (which will place the image in the content section) or just dropping the image location into the Multimedia Box image field when you’re creating or editing the page. As for creating a dropdown menu, this is a pretty handy tutorial on how to do that in Thesis. Hope it helps! Showing subpages is automatic in wordpress. You need just to have the depth of the menu defined into code. Making a checkbox to enable/disable subpages is totally unneccessary, while in most themes it is already default to show subpages, so it’s up to you, assign a subpage or don’t. The dropdown menu isn’t at all a great and unusual feature. John, from this and your other comment I think you might be missing the point of a theme like Headway. It’s about options. There are ways to do many of the features within WordPress itself, but they’re not nearly as easy as simply checking or unchecking a box. Also, the framework themes usually give you a level of control that can be difficult to achieve with WordPress alone. And last but not least, if you do these things within the theme, you can upgrade wordpress without having to worry about losing your edits to WordPress’ core files. I am a bit advanced in css and know basic php, so with a framework I still have to css my design, which is more work than tweaking an actually designed theme. Again, I am just trying to make my point that frameworks can be very helpful to designers, but I fail to understand how they can help the user who does not know css or is not a designer. So in my opinion the wordpress community needs predesigned themes and they’ll always be there. I shall give a 10 to Thesis for their marketing skills, and the product presentation. Do you know how Headway compares to Frugal? They both seem more “user friendly” for the non-techie than Thesis. I both have the Thesis and Headway theme but I find it that Headway is much more easier to use than Thesis because of it’s killer “Layout Editor.” I can manage everything I want from a few drag and drop and some resizing tweaks. I’m not yet done with my design and I really want to improve more so I have to learn more stuffs in the customization of css and functions. Headway is a great theme – check that out! Clearly, these types of frameworks are good for someone who is just-slightly-techie — enough to tweak things in option panels, etc. I want to know whether they are a wise investment for a serious (and techie) designer. 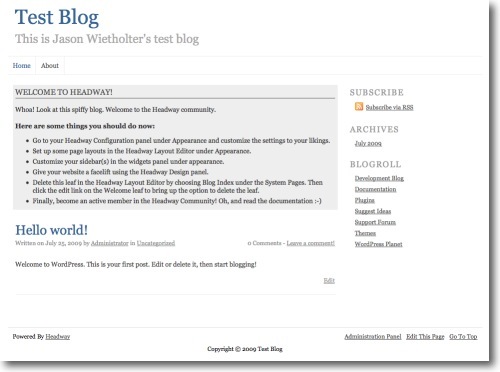 Right now, I’m looking a lot at Thematic (http://themeshaper.com/thematic-for-wordpress/), but hey — if cost 80 bucks or whatever for a rock-solid theme that made a ton of stuff easier out of the gate, I’d be all for that, as well. Chris, personally, I would recommend Thesis if you’re a serious designer. My design skills (minimal at best) have progressed by leaps and bounds using Thesis and if you already know what you’re doing, you’ll be able to make Thesis sing. Cool review. I’d like to say that I’ve used both Thesis and Headway and I’d like to classify myself as a designer. I’ve found Headway much, much easier to work with and the 1.5 update loads significantly faster than its predecessor, so that’s one complaint addressed. I have not personally moved a blog from Thesis to Headway, but I did talk to a guy who’s made the move painlessly. As far as “serious” designing goes, I’m currently using Headway to build client websites and not only is it fast, it’s extremely scalable. After starting the Headway Hack website (partly to force myself to keep learning more and more about it), I’ve found that no matter what people ask me to do – I can find a way in Headway that is generally quick and painless. I would definitely say check it out. I love this theme. How good is the SEO for Headway compared with Thesis? Any thoughts on Mimbo Pro? Any suggestions? I’d say I am average in skills… Thanks! I would say that Headway is about the same with SEO in comparison to Thesis. I haven’t used Mimbo but I’ll look into it. I believe both Thesis and Headway allow drop down menus, they both can give you wide layouts, they both offer good SEO and flexible layouts. I know this probably doesn’t help make your decision any easier but it’s the truth. However, I would highly recommend Thesis and as you can tell, I’m heavily invested in the Thesis community, having created 3 free skins for download with at least one more to come. I’ve currently got a custom wordpress blog being designed due to what used to be my very low knowledge of Wordpress. However, I’ve learned a lot since that project started and was wondering how difficult it will be to basically take the custom theme the company provides me with and put it into a system like HeadWay so I’ll be able to easily edit it. Would this be a real pain in the neck, or would it just entail copying and pasting a few key parts of code here and there? Chase, that would really depend on your design and how the company codes it. There’s just no easy way to answer that question. I’m thinking about trying Headway, but it’s requirements state PHP 4, what if I have PHP 5 installed? Does it matter? No, that doesn’t matter. PHP 5 is a newer version of PHP & Headway is listing PHP 4 as a minimum requirement so you’re ahead of the game. Good luck with Headway & let me know how you like it! How would you rank/rate/compare Headway, Thesis, and Builder from iThemes? I’ve not used Builder but I’d rate Thesis above Headway. My man Jason who wrote this review really liked Headway & I believe still uses it but after giving it a spin for a while I just found Thesis to be a lot more flexible. Headway’s definitely easy to move content blocks etc & arrange the content that they provide you leafs for, but if you want to go off script, it’s not nearly as easy as Thesis. Hi Ben, can Thesis and Headway help me create a mini site? Long single page with sales letter and no sidebars, widgets, and columns. Both themes would be able to do what you’re wanting. Thesis has a built in “no-sidebar” template (just select it from the pull down menu) that’s perfect for landing/sales pages. Headway let’s you determine the content displayed on a page by page basis so you can create it however you’d like. I am looking at using Headway to rehabilitate my webpage. I am completely ignorant on html etc. To date i have only used iweb to make and maintain my web info. Would a guy with limited (iweb like understanding) be able to handle Headway? There are certain design capabilities that I want to incorporate in my site, that iweb doesn’t yet handle, and Headway seems to offer them. But if I’m in over my head I don’t want to waste the $80 bucks. Actually I think Headway would be a perfect fit for you. I prefer Thesis but it doesn’t have the drag & drop functionality that Headway offers. If you don’t mind a little bit of learning, Thesis is my recommendation. Headway support is lacking. I have two unresolved tickets with them. Thank you for this post – I have been a custom website designer for years, and am now building out several WordPress sites for clients. After doing much research, it appears that you can’t go wrong with either Thesis or Headway. Headway seems better if you like drag & drop. I kind of like the Thesis admin look and it seems very clean. I’m used to coding and then looking, so working on the Thesis admin in one tab and then viewing updates in another is not an issue for me. For now, because of the great font options, strong support community and ability to customize, I am going with Thesis. I will remain curious about Headway though, and probably try it out in the future. I see that Headway requires an annual renewal. Does anyone know if Thesis requires annual renewal, or just recommends upgrades? I wanted child themes and since they are MONTHS overdue I contacted one of the companies that was supposedly developing them. They said that they had dropped out because Headway was having some real issues. The guy suggested I should try to get me money back, almost made it sound like they were having financial troubles. Are most of the themes being built today responsive themes? I’m especially interested in Headway and Thesis now, as a result of your conversation here, but it’s sometimes hard to tell whether platform responsiveness is now a given or still a special feature. Also, do you have any news about the support for these premium themes? Thanks Tony for your post about this, it’s an important issue to me. I have given up on Headway and am focusing on Ithemes. 1. Headway support is not so great, and they have some attitude. 2. There is grid layout issues as of 3.1. WIthout digging into the code, it’s quite hard to make the blocks stack against each other. 3. No child themes in 3.0 as of March 1. And finally, 4. I really am tired of their lack of decent business management and communication skills. They had a rushed job in November giving us a buggy product that they oversold big time. They are still catching up. Tons of hype but up to this point not a product you can reliably use UNLESS you are a coder. Which is ironic since their target market is non-coders.